This is considered as an advancing list with entries of Tarot/Tarock etc. evidence from Germany / Austrian / Switzerland. It first started as a collection of Austria alone ..., but then it was considered, that Germany should be included and also now Switzerland. So it will develop and be updated occasionally. As German language forms Depaulis identifies Taroc, Tarok, Daroque, Darock, Tarroque etc. No occurrence of these words is known in Germany before 1752 (says Depaulis) ... Depaulis refers to Sigmar Radau, "Tiertarock" (1989), who had listed some playing card tax laws and some other research. Meanwhile there are many own findings, between them also the oldest Tarock in a German language printed work in 1750/51. 1687: A cardmaker Antoine Joly, originally born in Lyons, who had worked in Montbeliard (earlier Mömpelgard) arrived 6 years after the French occupation of Strassburg (so 1687 ?) in Strassburg. Then, so says Depaulis, no cardmaker had been in the town or a longer time. "There is no evidence of any cardmaker in other places [in Alsace], even in Colmar, before the mid 18th century." Since 1707: Louis de Laboisse (from Paris) since 1707, Pierre Lachapelle (from Lyons) (1714-44), David Benoist (1717-1761) appear as cardmakers in Strassburg. Depaulis declared, that in this development Tarot decks with so-called Besancon-style, appeared. "Indeed we have at least one pack from each of the aforementioned masters .... They are all, save one, of the 'Besancon' variant of the Tarot de Marseille, with Juno and Jupiter. The one exception is a Tarot pack made by Louis de Laboisse, 'A la la Perle Orientale', where the two problematic cards ... have been replaced by 'Le Printemps' and 'L'Hyver'". Depaulis suggests, that the decks called "Tarot de Besancon" actually are Tarots from Strasbourg. He suggests a dating for the deck with "Le Printemps' and 'L'Hyver' instead of Pope and Popess of c. 1710. 1713: Francois Isnard (engraver) arrives in Strasbourg. 1720-35: Radau takes the SEBASTIAN IOIA deck in Besancon style (Kaplan II, p. 324) as from 1720/25. IN VERLAG BEY SEBASTIAN HEINRICH IOIA IN AUGSPURG WUNHAFFT BEY DER SCHWAHL MYHL. Depaulis notes, that Sebastian Heinrich Joja is documented from 1720-33, referring to S. Radau & G. Matthes, Deutsche Spielkarten 1650-1900, Nuremberg, GNM, 2001, no. 18. Kaplan has the cardmaker Sebastian IOIA as active from 1720 - 1785 (father and son ?). 1720-1750: Pelagius Mayer was born in Kempten - in contrast to earlier ideas - in 1690 and was active since 1720 in Constance. According Kaplan II p. 320 the latest documentary evidence of him is from 1737. The deck is at Kaplan II p. 325, again in Besancon style. 1729-1762: Franco Pratesi detected 2013 a resource about the export of Minchiate decks from Tuscany to other countries. Some of the decks went to "Northern countries". Genova, a city with some documented interest for Minchiate had totally 656 between 1732-1751. Most exports went to Roma - 45140. Totally 62517	Minchiate decks were exported from Toscana in c. 33 years. 1735 or later: Radau takes a deck of Johann Wolfgang Weber, Ulm, Besancon style, as from c. 1735. TAROS FIN DE IEAN WOLFGANG WEBER A VLME. Depaulis notes, that the cardmaker was active from c. 1735 - 1787, so the relevant deck might be of a much later time. The same painting is mentioned by Depaulis, but he doesn't repeat the dating. The content "Taroc-Spiei" could't be confirmed. It seems rather obvious, that this war and the following "Peace of Aachen" in October 1748 caused the rapid and explosive distribution of the Tarock game in the following years. A key element of the quick distribution might have been the installment of Swiss Guards at the courts of Austria and in Holland after the war (Tarock had been well installed in Switzerland long before). Another factor might have been the installment of scientific societies, the general use of coffee-houses and the increasing German interests in theater-plays. The development of Cartomancy in Germany followed soon (known first in 1763) in this generally developing society. 1748: A. B. Göbl in Munich opens his card producer shop and produces Tarot cards (the begin is not clear). Depaulis suggests, that this is possibly that, what in Bavaria this is addressed as "Welsches Tarock". WWPCM has cards, which are taken as "from 1750" and these are given as "Animal Tarock". But it has no trumps. This WWPCM is given as "from c. 1760" and it is a Besancon Tarot. 1750: FEINE TAROS BEY FERDINAND SCHOBER IN NEUHAUS 1750 ... Kaplan II didn't note this deck. Depaulis seems to know it: He calls it a "curious mixed Tarot / Trappola pack" and he identifies Neuhaus as Jindfichuv Hradec in the Czech republic (South of Prague). Depaulis notes, that this is momentary the oldest date for Taros (or similar) in Germany. Johann Franz von Palthen (1724 - 1804) - worldcat has a lot of publications, but I don't found a good biography. Worldcat offers the text partly as of 1750, books.google.com has it from 1751. The publication location is Stralsund, the author also published in Rostock. He is mentioned in a short biography of his father: http://de.wikipedia.org/wiki/Jakob_Palthen ... "Ihr Sohn Johann Franz (1725–1804) wurde Advokatfiskal am Wismarer Tribunal." 1751: Friboug - Switzerland. Claude Burdel Tarot (Marseille type ; Kaplan II p. 326/328), artist active 1751-1780. 1752: Sigmar Radau has found two playing card tax tariffs published in 1752. The first is from Saxony Altenburg (small duchy South of Leipzig) ..
... and notes"Ein Stück Taroc-Charten 4 Gr." The second is from Bavaria Juli 1752, which used "Daroquen" (an earlier law of 1745 didn't use it). Radau found another note from the same year: The Augsburger paper-maker Chr. A. Harz sent special paper for the production of Tarock cards to A.B.Göbl in Munich. Around 1755: Johann Rauchmiller in Salzburg produced Tarock cards around this time. A price list of the producer in 1738 hadn't Tarock cards. End of 1755, Berlin: A closed society of 100 persons, mostly scholars, is established in a coffee-house. A Tarock-scene is described, which took place there (with the participation of Euler, a famous mathematician). This scene likely took place 1755 or 1756, short before the 7-years-war. Nicolai, F. : Einige Bemerkungen über das Tarockspiel, und über die erste Erfindung des Kartenspiels überhaupt. in Book III, Chapter 20 "von spilen"
... used in his texts about the basic of arithmetik, which demands in his opinion not more attention, "als ein Frauenzimmer braucht das Taroc spielet"
1761: One-act comedy by Karl Franz Romanus: "Das Tarocspiel", printed in Dresden and Warsaw. "Taraux" is mentioned at page 4. The author uses "Würfel" (dice) for Carreaux, "Kleeblatt" for Trèfle, "Schüppen" for Pique and the usual "Herzen" for hearts. One role has the name Tarofolo. 1770: "Das La Fontaine-Tarock des Leipziger Kaufmanns Peter Friedrich Ulrich. Faksimile-Nachdruck eines Tier-Tarockspiel von 1770 aus dem Besitz von Erwin Kohlmann, Naumburg." "Mandat von Anno 1770 den Kartenstempel betreffend"
This is the state of 1521, when also some Institutions were integrated in the system (countries of the Kurfürsten). ... one related to Konstanz, another to Ulm, the third to Augsburg and the fourth was Baden. Konstanz, Ulm and Augsburg are just those cities in Germany, which report as first the production of Tarock games in the Besancon style (between 1720 - 1750), before the BIG TAROT WAVE in Germany started ... perhaps cause specific laws, which were Tarock friendly in contrast to the other laws in other Reichskreise. Der Schwäbische Reichskreis seems to have been very special ... it's called the "„der vielherrigste Kreis im vielherrigen Deutschland“, which says at one side, that it had the most independent participants (about 100), but this might just indicate, that this region had been very rich, at least till the 30-years war (1618-48). The Fugger, richest banker in all Europe in their good times, lived in Augsburg, and also Ulm is considered to have then its best time. Similar is in Germany only the Fränkische Kreis around Nuremberg. The Schwäbische Reichskreis installed a constant army, which wasn't done in other Kreise. ... that the name "Tarot de Besancon" is ironical, and that the true origin would be Strassburg and the Elsass. I don't know, on which facts this is based, I just got the snippet and I am astonished. Strassburg became "France" in 1681/87, but in matters of customs it (and other parts of the Elsass) stayed "Germany" till 1789 ... so the Tarot/Tarock way from Strassburg to Constance and Ulm and Augsburg would have been free and was not molested by too much difficulties. Solothurn in Switzerland (with a Tarot de Marseille in 1718 by Francois Heri and a "Tarot de Besancon" a little later) is considered to have gotten this version also from Strassburg. Nidwalden (1572, 1588, 1620 and then variously till 18th century) and Lucerne (1593 - Lucerne is 20 km from Nidwalden) are the earliest dates of "positive" Tarot activities. Geneve follows (1609, 1615, 1617 and 1635) with prohibitions (so "negative") and a prohibition is also recorded for Zürich (1650). Then I found a list in the Tarot-Rules book of Dummett/McLeod. This contained rätoromanische names for Tarot cards. Rätoromanisch is a language. It is spoken in the region designed as "rätoromanisch" on the map. Other colors at the design a dominance of German, French and of Italian spoken in Switzerland. The name of the card 14 ... usually Temperance ... is given with an equivalent for "Angel". This remembered me on the Fama Sol problem. 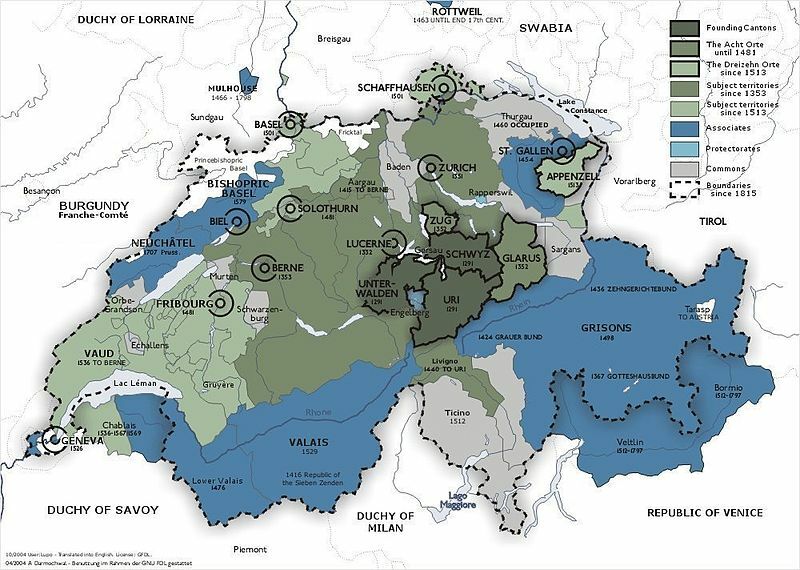 This map was based on that, what I knew about "Troggen" developments in Switzerland till 1650. The region of the Vierwaldstätter See was then perceived as a place, which was positive for the Italian Tarocchi. ... which says, that the German language Schweiz in 18th century preferred NOT the Besancon Tarot, but the Tarot des Marseilles style. Special attention finds the location Rotzloch, which - again - is very near to the Vierwaldstätter See (15 km to Lucerne). Uri, Schwyz und Unterwalden formed the basis of the later development of Switzerland (1291). When the city Lucerne (then 3000 inhabitants) joined, the whole got some substance and other cities followed. ... Pope Julius invited some Swiss military in the Palace of the Vatican. This was about a month later than the production and deliverance of some Tarocchi cards in Avignon. Well, as already pointed out variously, Pope Julius had been before 1503 cardinal of Avignon for a little less than 30 years and in this period Avignon became an important playing card production location. Well, at least the leader of this "Swiss delegation" had been "Caspar von Silenen, burger von Luzern" , but likely also some of his men came from this region. 147 of 189 soldiers died during the sacco di Roma at 1527 May 6. The Swiss Guard was restored in the years 1548-1552 and endured till 1798 ... then restored in 1800. It's called one of the oldest military institutions. 1572. The Nidwaldner Kirchengemeinde (Switzerland) allows 3 card games: "troggen, munteren, keysseren" (29 September 1572). Oldest known note of the Tarot game in Switzerland. 1588. The Nidwaldner Kirchengemeinde (Switzerland) repeats the allowance of 1572. The "Schantzspyll" (a game of luck) and playing at the night is forbidden. 1593. The Troggnspielis noted in Lucerne. "Nidwalden" and "Obwalden" were united to "Unterwalden" and that's a "Kanton" region of Switzerland (see map). Nid- comes from Nieder- (=lower) and Ob- from Ober- (=higher). Observing this it seems not to be a riddle, who distributed the Tarocchi in Switzerland and why they are just found first in Lucerne and this region. Returning Swiss Guard members brought them. Somehow it's also understandable, why just this region avoided to exchange Pope and Popess with other figures. Swiss Guards were not only in Rome ... but it's a question, if the Swiss guards elsewhere came from the same locations in Switzerland. In France, here they had their second major engagement, they likely would have come from the French speaking part of Switzerland. In modern times the Wallis is mentioned as the major resource for Swiss Guards in Rome ... quite understandable, cause the Wallis has a long border to Italy and iikely a lot of persons know there Italian language since birth. There were two different corps of Swiss mercenaries performing guard duties for the Kings of France: the Hundred Swiss (Cent Suisses), serving within the Palace as essentially bodyguards and ceremonial troops, and the Swiss Guards (Gardes Suisses), guarding the entrances and outer perimeter. In addition the Gardes suisses served in the field as a fighting regiment in times of war. The Hundred Swiss were created in 1480 when Louis XI retained a Swiss company for his personal guard. By 1496 they comprised one hundred guardsmen plus about twenty-seven officers and sergeants. Their main role was the protection of the King within the palace as the garde du dedans du Louvre (the Louvre indoor guard), but in the earlier part of their history they accompanied the King to war. In the Battle of Pavia (1525) the Hundred Swiss of King Francis I were slain before Francis was captured by the Spanish. The Hundred Swiss shared the indoor guard with the King's Bodyguards (Garde du Corps), who were Frenchmen. The Hundred Swiss were armed with halberds, the blade of which carried the Royal arms in gold, as well as gold-hilted swords. Their ceremonial dress as worn until 1789 comprised an elaborate 16th century Swiss costume covered with braiding and livery lace. A plainer dark blue and red uniform with bearskin headdress was worn for ordinary duties. The Cent Suisses company was disbanded after Louis XVI left Versailles in October 1789. It was however refounded on 15 July 1814 with an establishment of 136 guardsmen and eight officers. The Hundred Swiss accompanied Louis XVIII into exile in Belgium the following year and returned with him to Paris following Waterloo. The unit then resumed its traditional role of palace guards at the Tuileries but in 1817 it was replaced by a new guard company drawn from the French regiments of the Royal Guard. King Francis I of France used some 120,000 Swiss mercenaries in his wars. In 1616, King Louis XIII gave a regiment of Swiss infantry the name of Gardes suisses (Swiss Guards). The new regiment had the primary role of protecting the doors, gates and outer perimeters of the various royal palaces. This unit was officially a regiment of the line, but it was generally regarded as part of the King's Military Household. King Louis XIII anyway had Tarocchi cards. During the 17th and 18th centuries the Swiss Guards maintained a reputation for discipline and steadiness in both peacetime service and foreign campaigning. Their officers were all Swiss and their rate of pay substantially higher than that of the regular French soldiers. Internal discipline was maintained according to Swiss codes which were significantly harsher than those of the regular French Army. By the 16th century the Swiss Guards were brigaded with the Regiment of French Guards (Gardes Françaises), with whom they shared the outer guard, and were in peace-time stationed in barracks on the outskirts of Paris. Like the eleven Swiss regiments of line infantry in French service, the Gardes suisses wore red coats. The line regiments had black, yellow or light blue facings but the Swiss Guards were distinguished by dark blue lapels and cuffs edged in white embroidery. Only the grenadier company wore bearskins while the other companies wore the standard tricorn headdress of the French infantry. The Guards were recruited from all the Swiss cantons. The nominal establishment was 1,600 men though actual numbers normally seem to have been below this. I get "En 1573, Charles IX de France institua les gardes suisses." This is interesting, as 1573 definitely is the time, when the Tarot started to become also a French game. But we have for the moment only one single note about "Troggen" from this early time. From 1579 on, a Swiss Guard served the House of Savoy, rulers of Savoy and later the Kingdom of Sardinia. The Guard was dissolved in 1798.
and this signals an increased interest just at this time at the Savoy court. From 1696 to 1713, a Swiss Guard served at the court of Frederick I of Prussia. This is with no doubt of interest, as we've in this time much French influences in Prussia, but we don't have confirmation, that in this time happened anything with Tarot. a Swiss Guard also existed in the Grand Duchy of Tuscany. a Cent-Suisse unit was in existence from 1730 until 1757 and again from 1763 to 1814 in the Kingdom of Saxony. a similar unit existed from 1734 until 1789 in the Kingdom of Naples. Swiss line infantry regiments continued to serve in the Neapolitan Army until the 1860s. From 1748 until 1796, a company of Swiss (Cent-Suisses) served as a personal guard for the Stadhouder of the Dutch Republic; besides a Dutch Guard Regiment, there was also a Swiss Guard Regiment. William I, the King of the Netherlands, incorporated four regiments of Swiss infantry in the new Dutch Army between 1814 and 1829, of which the 4th (Regiment Swiss nr. 32) served as Guard Infantry, until the Swiss regiments were disbanded and new official Guard Regiments of Grenadiers and Jagers were raised. For a brief time (1748–1767) during the reign of Empress Maria Theresa (reigned 1740–1780), approximately 250 to 450 soldiers from Switzerland guarded the Hofburg, the winter palace in Vienna. They replaced previous military units that had performed that duty, and were later replaced by others. The oldest courtyard of the palace is still called the "Swiss Court" (Schweizerhof) in acknowledgement of their 20-year presence. In Portugal, a Swiss regiment was raised by the Count of Lippe on June 12, 1762. It comprised two battalions (commanded by Colonel Gabriel Thorman and Colonel Marcus Saussure) of 809 men each, consisting of four companies of Swiss troops plus four non-Swiss companies, for a total of 1618 men. Enlistment was for six years, and the soldiers could not be required to serve at sea. Half the soldiers had to be Swiss, while the other half could be made up of Germans and Hungarians. The Portuguese government paid the sum of 2,960,000 reis to raise, arm and equip these two battalions. Colonels paid for their officers. Each soldier earned 4,537 reis per month plus a daily ration of bread. On June 22, 1763, Colonel Gabriel Thorman was sentenced to imprisonment until he returned funds and property embezzled from his regiment, while Colonel Marcus Saussure was sentenced to death for desertion. The regiment was disbanded on 17 September 1763 by a decree that also ordered the raising of a new Swiss regiment (the "Reais Estrangeiros"), which met a similar fate to its predecessor. Its eight companies comprised ninety soldiers each, plus the superior and inferior officers. It was ordered dissolved in 1765, and its commander, Colonel Luiz Henrique Graveson, condemned by a council of war to death by hanging. This sentence was commuted to a firing-squad, and the execution was carried out on November 15, 1765, in the field of Ourique, on January 2, 1766. My own studies with "Collection French Tarot dates 1500-1700" about the French part of the development of French Tarot cards led to an observation, that the important movement towards the adaption of Italian cards happened 1570-1580. B. "From 1579 on, a Swiss Guard served the House of Savoy, rulers of Savoy and later the Kingdom of Sardinia. The Guard was dissolved in 1798." Nachdem anscheinend eine Truppe, bestehend aus der Schweizer Garde des Königs und den persönlichen Leibwächtern des Herzogs von Anjou, unter der Leitung des Herzogs von Guise, den Admiral in seinem Haus ermordet hatte, wurden die übrigen Hugenottenführer getötet. Viele Berichte enthalten den Ausruf „Der König will es!“, der wahrscheinlich vom Herzog von Guise stammt und von dem Volk als Massenexekution interpretiert wurde. Eine Welle von Gewalt wurde ausgelöst, vermutlich Resultat der religiösen Spannungen der letzten Jahre und besonders des Edikts von Saint-Germain, und breitete sich über ganz Frankreich aus. ... which gives the information, that the total group were "about 100 men". Generally there's a long dispute about the true story of this event. .. and English wikipedia calls him only "a suspect in the murder of the Admiral in August 1572". ... an influential Italian lady in French history, whose father was Ercole d'Este II, who as an 8-years old boy got some Tarochi cards in 1516. And he was one the persons in the "war of the three Henry" 1588/89, which saw French king Henry III murdering duke Henry of Guise in December 1588 and falling victim to the troops of the later king Henry IV of Navarra in 1589. This is interesting, but I had difficulties to recognize very remarkable things about the date "1573" in connection to "Gardes Suisses" in most sources. ... and it seems to say that he commanded a Swiss troop with bodyguard function from 1573 - 1579, so partly in the service of French king Charles IX till 1774 and then in the service of king Henry III ... till 1579, and this was the year, when Henry III installed the new knight order "l'Ordre du St. Esprit" andpossibly exchanged his bodyguard system. ... where "1573-1579 : Guillaume Tugginer" is listed as "Colonels généraux des Gardes Suisses" with no immediate predecessor since 1570 and no immediate follower till 1616. Then the office seems to be reinstalled by King Louis XIII. Guillaume Tugginer, perhaps better known as "Wilhelm Tugginer" (A book was written: Zwei Solothurner Söldnerführer: Wilhelm Frölich und Wilhelm Tugginer (1985), was born in Zürich, but was welcome in Solothurn after his French services. He became "Senateur" of the city. and died 1594. Whilhelm Frölich was the uncle of Wilhelm Tugginer. Solothorn was from 1530 to 1792 the seat of the French ambassador to Switzerland. It was rules by an oligarchy formed by patricians till 18th century. From the first half of 18th century there appeared Tarot decks made in Solothurn. A Tarot des Marseilles by Francois Heri is given to 1718 (Kaplan II, p. 314/317), a deck with Tarot de Besancon (Kaplan II, 314/218) style by the same producer (without noted date) is given to c. 1730. Other later Besancon style decks from the same place are known. ... who had to free his country from French occupation in the 1550's. He was also able to restore Turin as the capital in 1563. Since 1579 he attempted to get Saluzzo ... Saluzzo was in the hands of France. 1579 is now just the year, when Guillaume Tugginer stopped to be "Colonel généraux des Gardes Suisses" and when the Gardes Suisses are said to have started to work for Savoy. Well, this look three coordinated actions. The Swiss military, distributed in many countries, are said to have avoided to fight each other ... this was part of their contracts. ... who took the opportunity of the French civil war (war of three Henry) for the right time to clear the open questions about it 1588. French king Henry IV of Navarra wasn't happy about it, but had to give way and traded an exchange against some other lands. Having been successful with this, Charles Emanuel attempted to take Geneva (1602). This went wrong, deadly wrong. The problems between Geneva and Savoy reached back till 15th century ... more details at the Geneva page. Geneva had then to have the first Swiss Tarot prohibition in 1609 and endured to have it long time. And the next city with Tarot prohibition was Zürich. And when Charles Emanuel had taken Saluzzo, he eliminated Protestantism at his territory. And with this the Swiss Tarot riddles turn clear. The city grew up around Sankt Leodegar Abbey, founded in 840 AD, and remained strongly Roman Catholic into the 21st Century. In 1850, 96.9% of the population was Catholic, in 1900 it was 81.9% and in 1950 it was still 72.3%. In the 2000 census the religious membership of Lucerne was; 35,682 (60%) were Roman Catholic, and 9,227 (15.5%) were Protestant, with an additional 1,979 (3.33%) that were of some other Christian faiths. There are 196 individuals (0.33% of the population) who are Jewish. There are 1,824 individuals (3.07% of the population) who are Muslim. Of the rest; there were 1,073 (1.8%) individuals who belong to another religion, 6,310 (10.61%) who do not belong to any organized religion, 3,205 (5.39%) who did not answer the question. Geneva has historically been considered a Protestant city, but substantial immigration from France and other predominantly Roman Catholic countries over the past century has changed its religious demography considerably. There were over twice as many Roman Catholics as Protestants living in the city in 2000. From the 2000 census, 66,491 or 37.4% were Roman Catholic, while 24,105 or 13.5% belonged to the Swiss Reformed Church. Of the rest of the population, there were 3,959 members of an Orthodox church (or about 2.22% of the population), there were 220 individuals (or about 0.12% of the population) who belonged to the Christian Catholic Church of Switzerland, and there were 2,422 individuals (or about 1.36% of the population) who belonged to another Christian church. There were 2,601 individuals (or about 1.46% of the population) who were Jewish, and 8,698 (or about 4.89% of the population) who were Muslim. There were 707 individuals who were Buddhist, 474 individuals who were Hindu and 423 individuals who belonged to another church. 41,289 (or about 23.20% of the population) belonged to no church, are agnostic or atheist, and 26,575 individuals (or about 14.93% of the population) did not answer the question. I don't know, how the Savoyan "Swiss Guard" precisely behaved, when Emanuel Philibert attacked Geneva .. this might be worth some study. But the Tarotica text of 1584 fits with the general picture. ... that the name "Tarot de Besancon" is ironical, and that the true origin would be Strassburg and the Elsass. I don't know, on which facts this is based, I just got the snippet and I am astonished." Now I've again the mentioned Depaulis article before me, and I see, that I've earlier overlooked a few pages, and there he wrote about his theories about Strasbourg and the origin of the Becancon in Strasbourg. At end of page 73 the article had a sort of graphical line, which I earlier must have taken as "finish of the article", which was wrong. Sorry, my error. So Depaulis in IPCS 39/2, p. 64-79 "When (and how) did Tarot come to Germany" starts at p. 74 his chapter 4 "From 17th century France to 18th century Germany" with a sort of subtitle after the introduction "A short history of France and Alsace". In the introduction he mentions, that Dummett and McLeod had assumed, that Tarot entered France via the Alsace: I think, he means these statements from pp. 26-29. 1618-1648: French troops participate and are in Alsace and Lorraine. French troops occupy parts of the Alsace (1639-43). French troops occupy Freiburg im Breisgau 1648 and keep it till 1697. After 1648: Further "legal actions" to get the Alsace under control. ... arrived 6 years after the occupation of Strassburg (1687 ?) in Strassburg. Then, so says Depaulis, no cardmaker had been in the town or a longer time. "There is no evidence of any cardmaker in other places, even in Colmar, before the mid 18th century." ... says Depaulis. All following cardmakers in Strasbourg have French names and come from " 'Inner France', Paris, Lyons, Thionville (Lorraine), or even as far from Albi and Bayonne". My note: France made regulations, who was allowed to move to the Alsace. Huguenots were very early "not allowed". Generally there was the strategy to transform the population to "Pro-French". This was also by Germans under Bismarck in occupied regions of Poland. Likely a very old strategy since antique times. As playing cards were propaganda, there likely was an interest to control the political direction of the producers. Depaulis assumes, that no playing card maker had been in Srassburg since early 17h centur (likely he assumes, that production broke down in the 30-years-war). After Joly, who worked till 1720 (no deck survived from him), he names Louis de Laboisse (from Paris) since 1707, Pierre Lachapelle (from Lyons) (1714-44), David Benoist (1717-1761) and Guilleaume Assine from Albi and adds then a "and others". "Indeed we have at least one pack from each of the aforementioned masters, save Assine. They are all, save one, of the 'Besancon' variant of the Tarot de Marseille, with Juno and Jupiter. The one eception a Tarot pack made by Louis de Laboisse, 'A la la Perle Orientale', where the two problematic cards ... have been replaced by 'Le Printemps' and 'L'Hyver'. All are difficult to date. A deck made by Lachapella is given to "perhaps 1715" and the deck of Laboisse is considered earlier. The figure of Printemps uses elements of a picture "Nicolas de Largillière: La belle Strasbourgeoise" (made in 1703; but the card uses uses not the big hat). The relevant deck - perhaps - might have been made c. 1710. So this might be the "mother" of Bolognese Moors, Juno and Jupiter, and Belgian Captain Fracasse and Bacchus. "Isnard" at aeclectic and forum.tarothistory.com appears only in minor occurrences. As I often perceive, that important matters are not registered, I note here ... :-) ..
Depaulis styles him as a superman in matters of Tarot. All, what I've read, sounds impressive. Depaulis seems to have solved a key riddle there. D'Allemagne, I, p. 316, Joseph Isnard buys the office of inspector and controller of cardmakers from the Veuve Toulon, in 1755. She was the widow of Jean Toulon, who died on January 15, 1755. Yes, I saw your notes in two of the few comments in the Forums. But if I understand Depaulis correctly, he suggests, that Strassburg influenced Switzerland to take partly the Besancon style, and for Strassburg stands mainly Isnard and he influenced the early German Tarot scene, was possibly imitated by the Belgians and even by Bolognese cardmakers by the use of exchange cards for pope and popess, possibly he was the first to use French suits and somehow also influenced the Animal Tarock. If all this (or even only a part) is true, Francois Isnard would be a sort of "Superman" in the history of Tarot. I have no idea of Joseph Isnard in Marseille and François Isnard in Strasbourg are even related. There seem to be a lot of Joseph Isnards anyway... one is an organ maker. None of the bits and pieces Google pulls up seem to be the Marseille one. What do you mean by "Bolognese cardmakers"? The change from Papi to Mori in Bologna happened at a precise moment, in 1725, for a very specific reason. François Isnard can have had nothing at all to do with it. Ross G. R. Caldwell wrote: I have no idea of Joseph Isnard in Marseille and François Isnard in Strasbourg are even related. There seem to be a lot of Joseph Isnards anyway... one is an organ maker. None of the bits and pieces Google pulls up seem to be the Marseille one. In any case, what do you mean by "Bolognese cardmakers"? The change from Papi to Mori in Bologna happened at a precise moment, in 1725, for a very specific reason. François Isnard can have had nothing at all to do with it. Well, the idea was to exchange Pope and Popess, and the major part of these exchanges might have been, to make Tarot decks acceptable for protestant regions. But once it was born as a habit, it could be imitated for other reasons (in Catholic Bologna). The Strasbourg productions are earlier, if we follow Depaulis' argumentation. I've some indication, that this exchange-technique was already done much earlier than the Strasbourg productions. I just work on an article. I think it was already a habit in Florence and south (like on the Colonna sheet from Rome, where there is a Sultan numbered 5) to make the papi into secular or non-Christian figures, in the 16th century. Bologna was the last hold-out, until 1725. It reflects this southern trend, rather than the northern one.